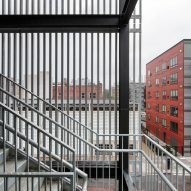 Salmela Architect has completed an office building for a Minneapolis advertising agency featuring a gridded monochrome facade and a monumental fire escape. 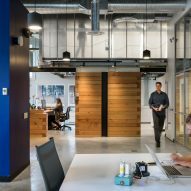 Called Fast Horse, after its new occupant, the building was formerly an automotive repair shop in an underused area of Minnesota's largest city. 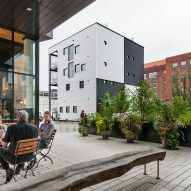 Local firm Salmela Architect added two storeys to the structure, so the building now encompasses 9,000 square feet (836 square metres) of enclosed space and 3,000 square feet (280 square metres) of terrace and balcony spaces. 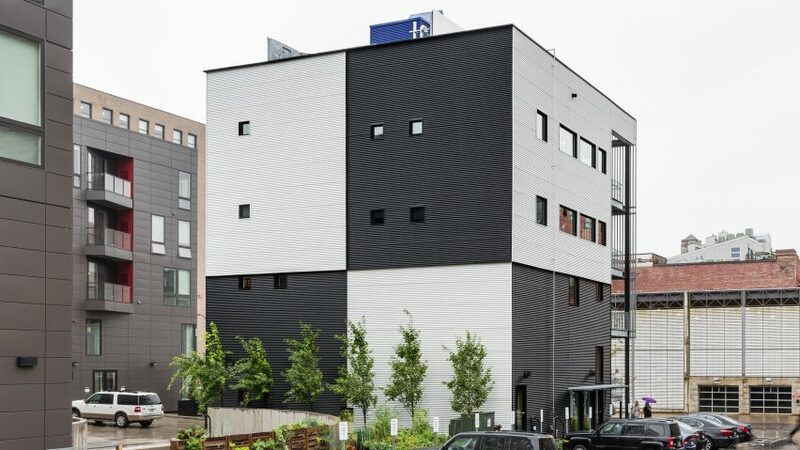 Cost-efficient corrugated steel panels were chosen for the exterior cladding. With tones of both black and white, these give the building a chequerboard-like appearance. 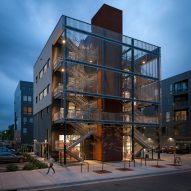 A prominent pair of fire evacuation staircases run up one of the exterior walls, linking up with a set of balconies. The architects envisioned these as more than a purely functional feature. 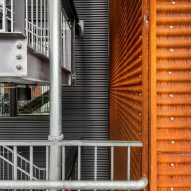 The metal structure acts as a shade buffer for the building's southern facade, while providing a variety of spaces where workers can sit outdoors. 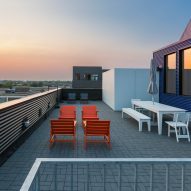 It also extends up to the rooftop, where there is an outdoor gathering space for the agency's employees. 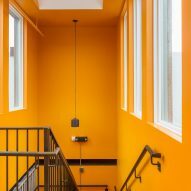 "What was abundant was the faith the client placed in the idea of frugal innovation," explained the architects. Inside, the aim was to create a range of conditions to suit a non-traditional workplace. Decorations were kept to a minimum, and visible steel structure and mechanical equipment give the spaces a utilitarian feel. Rather than open-plan floors, the floors are divided up into areas of different sizes, suitable for various activities. 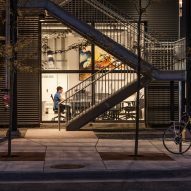 "The entire construct emerged as a series of spaces with varying sizes and degrees of visual and acoustic privacy," said the architects, describing their goals as being "freedom, creativity, flexibility but also functionality". "Each person decides for themselves the most suitable environment for the work that they are trying to accomplish on that particular day," they added. Salmela has completed several other projects in the Midwestern state of Minnesota. These include a country home that draws cue from local agricultural buildings and a remote cabin that features a stark white sauna overlooking Lake Superior.